Things have been so hectic of late that I almost missed this February 28 article in Nature announcing that the new Kjell Henriksen Observatory on Svalbard, a remote Norwegian island, is now open for business. The observatory is described as "a window into space," since it's designed to study aurora borealis, a.k.a. the Northern Lights, and thus it is outfitted with highly sensitive optical instruments from some 16 institutions in seven different countries -- the better to perform those studies. The spectacular kaleidoscopic effects of the Northern Lights result from the collision of charged particles dumped into the Earth's magnetosphere by perturbations. The lights tend to only be visible in polar regions because those particles follow the Earth's magnetic field lines -- which fan out from the vicinity of the poles. Hence, the location of the new observatory in such a frigid area. It's not exactly an ideal working environment for the scientists there: a polar winter is harsh, and pretty much from late October until, say, mid-March, Svalbard is stuck in almost 24-hour- darkness. And what a commute! They have to drive along an ice-bound Advent Valley to the island's only remaining functional coal mine, and then hop into army-surplus vehicles outfitted with caterpillar threads to get them up to the top of Advent Valley. And they can't even use their headlights, since it will interfere with the sensitive instruments. The Nature article reports that at the moment, the scientists can't even get into the building via the main entrance, since it's currently buried under snow; they have to use the back door. If a storm hits, they resort to sleeping in bunk beds. Finnish Lapland -- home to the Sodankyla Geophysical Observatory (SGO) -- is only slightly more hospitable. It, too, is a vast frozen expanse, and eerily silent much of the time because of the pronounced lack of foliage. The slightest of sounds can be amplified over large distances; in fact, I'm told that it's possible to hear dogs barking from villages a mile or so away. The indigenous Sami people tell stories of the aurora borealis singing and whistling as its light approaches earth. In the Sami language, "aurora" translates into "audible light." Needless to say, I'm a huge fan of this sort of natural phenomenon, but Irish-born artist Anna Hill has gone way beyond the admiring awe most of us feel at such displays. In March 2003, she trudged into the frigid landscape with her trusty Hassleblad camera and a video cameraman named Mark Szassy in tow. They were there not just to photograph the Northern Lights, but to make low frequency radio field recordings of the the swooshing and crackling sounds that locals believe are associated with the most intense auroral displays. The result of all her hard work was "Aural Synapses," an award-winning multimedia art project that debuted at the Kilkenny Arts Festival later that same year. (You can hear a sound sample of these low-frequency sounds here, and a radio interview with Hill here.) It's not just the stunning visuals that made the exhibition such a success: it was also the haunting, eerie soundtrack that blended Hill's field recordings of the Northern Lights with the ethereal vocals of Irish singer/songwriter Iarla O'Lionaird and electronic instrumentals. It's safe to say that the majority of scientists who do research in this field are skeptical of the notion that the aurora's dazzling light show has its own built-in soundtrack, but while visiting Lapland, Hill worked closely with a geophysicist who does: Esa Turunen of the SGO, whose research focuses in part on scientifically establishing the audibility of the phenomenon. Certainly the aurora borealis produces sounds in space, and those sounds are monitored and recorded regularly by observatories all over the globe, including the SGO. But the sounds heard on Earth are probably more local in origin. Field instruments are finally sensitive enough to capture these weird sounds for empirical analysis, hampered a bit by the fact that the sounds only occur during the most intense geomagnetic activity. The Helsinki University of Technology (HUT) has an Auroral Acoustics program that statistically analyzes field recordings of auroral acoustics and compares them to a "control group" of recordings from nights when there was no geomagnetic activity. It's an ongoing project, but to date, findings support the anecdotal evidence: the sounds are real, they strongly correlate with particularly intense auroral displays, and they are produced locally, although scientists remain mystified by the exact mechanism doing the producing. Not that Anna Hill needed convincing, having heard the sounds firsthand. "Aural Synapses" is her attempt to let others share her experience, using music, photographs and technology to make the installation as interactive as possible. For instance, the exhibit featured an interactive contact microphone, inspired by the breath sensors used by NASA astronauts: viewers could breath into it and the audio and visual elements would "react" to the breathing patterns. Right now, Hill is involved with a project called Space Synapse, in conjunction with the European Space Agency, developing a "Remote Suit": a wearable computer intended for remote communication of sensory input and telemetry from extreme environments, both on Earth and in space. The very first prototype? Why, the Auroral Suit, of course! It responds to data gathered from the ionosphere using wireless transmissions from Sudden Ionospheric Disturbance monitors. Anyone wearing the Auroral Suit can listen to the sounds of the Northern Lights. We would love one, but it's still in the prototype phase. Also? I'm guessing it will be crazy expensive. I know what all you movie fans are thinking right about now: "But I thought in space, no one could hear you scream?" Technically, the famous Aliens tagline got it right: sound needs a medium through which to propagate, and there isn't much of one in deep space, which is about as close to a cold, dark perfect vacuum as you can get. But there's some fine print. Poke around between the planets and other celestial bodies, and you'll find plasma (hot ionized gas), i.e., in the atmospheres of Venus, Mars, and Saturn's moon Titan, not to mention Ganymede, one of the moons of Jupiter. Plasma gas is thinner (by a lot) than the Earth's atmosphere, but it's just dense enough to allow sound waves to propagate. In fact, according to Don Gurnett, a physicist at the University of Iowa who builds plasma wave receivers for NASA, the sounds of space are far more varied and complex than on Earth, because of the ionization: plasmas produce a mixture of acoustic and electromagnetic waves (the latter usually in the radio frequency of the spectrum). Gurnett says that when his team first launched a plasma wave receiver into Earth's orbit in 1962, they were "astonished to find that space is filled with a rich variety of sounds." He's been collecting recordings of space sounds ever since (more than 40 years now! ), from all the major missions, including Voyager I, Galileo, and Cassini. What do plasma waves sound like? It depends. Lightning produces whistling sounds, regardless of whether it strikes on Earth or on Jupiter, and of course, so do the charged particles in Hill's aurora borealis. The magnetic fields surrounding the planets can trap electrons, producing bird-like chirps. And the sun emits high-velocity plasma known colloquially as the solar wind, which produces turbulent shock waves and an accompanying roaring boom. To Gurnett's ears, it sounded a lot like music. 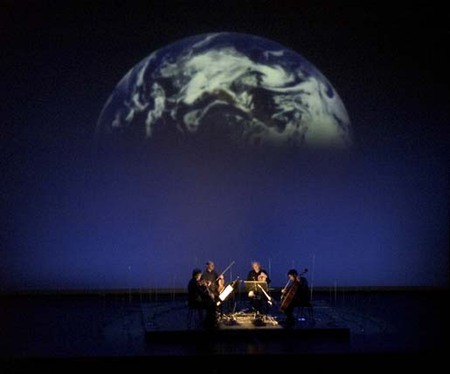 Minimalist composer Terry Riley agreed when he heard them: he drew inspiration from Gurnett's recorded space sounds while composing "Sun Rings" for the Kronos Quartet several years ago. "Sun Rings" is a suite of 10 "spacescapes," each a complex layering of musical elements combining Gurnett's celestial sounds with projected space images and the world-famous string quartet in a live multimedia production. (Note that multimedia seems to be all the rage when it comes to making music from the sounds of space -- the marriage of visual and aural is an unbeatable combination!) Composing the piece took Riley over a year, and made for some interesting inspirations. He's said in interviews that the crackling and squealing sonic patterns from the magnetic field around Ganymede reminded him of a voice saying "beebopterismo" -- and that became the starting point for one of the movements in the "Sun Rings" suite. "Sun Rings" first debuted in 2002, and has been performed all over the world since then, garnering rave reviews. For instance, the Los Angeles Times dubbed it "an empyrean masterpiece" that ushered in "a whole new chapter in the age-old quest for a music of the spheres." (You knew someone had to bring up that Pythagorean chestnut, right? If they hadn't, I certainly would have done so. Jen-Luc Piquant would never forgive such a lapse.) Alas, the Kronos Quartet has yet to make an official commercial recording of the suite -- they're very busy people, in high demand -- but it's only a matter of time. I hope. It could be an expensive proposition given the multimedia aspect. Why can't NOVA team up with Masterpiece Theater or that PBS staple, "Great Performances," to share the costs? Granted, Riley isn't the most mainstream of composers, but I don't see how you go wrong with Kronos + Pretty Pictures of Space + Weird Cosmic Sounds. While we're waiting, you can listen to some samples at Gurnett's Website and on NPR. David Harrington, artistic director for Kronos Quartet, told the Tucson Weekly in 2002 that he considered Gurnett "an instrument maker.... He made an instrument that was able to translate plasma waves into sound. Gurnett is more circumspect, insisting that he's no musician, and doesn't even play an instrument. But he admits that he must have some innate musical sensibility: "I always recognized these sounds as having a musical quality. That's why I started collecting them in the first place." As with the aurora borealis, the exact mechanisms by which these sounds are produced remain something of a mystery. "If you're sitting in an absolutely quiet room, you don't expect the molecules in one particular corner to the room to suddenly start singing at you, but this actually happens in a plasma," says Gurnett. And studying this unique acoustical feature of plasma does have some bearing on a far more practical concern: making controlled fusion a viable energy source here one earth. One of the biggest problems with generating nuclear fusion in our big terrestrial machines (like ITER, still under construction) is that the machine starts generating these plasma waves, thereby disturbing the orbits of the subatomic particles. The result is massive energy losses, which is one of the main reasons why we have yet to tap into the sun's energy source to meet our own growing energy demands. The conversion rates (and economies of scale) just aren't up to par yet. Riley's suite, and Hill's multimedia installation, might challenge some people's concept of the kinds of sounds we consider to be "musical," i.e., aesthetically pleasing. But the underlying physical observations -- the sounds of the cosmos -- challenge our basic assumptions of what constitutes "sound." Most of us think of sounds as something we can hear, but in truth, our range of hearing is limited to a very narrow frequency range. In fact, we're talking about simple pressure waves traveling through a medium, at frequencies that are both too high and too low for the human ear to detect -- not just those waves whose frequencies we can hear directly. As such, acoustics provides a useful new lens through which to view celestial phenomena. That's why studying the acoustics of celestial bodies is pretty much all the rage these days in astrophysics circles. For instance, check out Paul Burke's sonification of a pulsar, or this analysis of ultrabass sounds of the giant star Xi Hya. Artists like Hill, and composers like Riley, are just taking that fundamental research and putting it to excellent aesthetic/creative use. In this case, scientists think they understand the mechanism at work to produce the "sounds": the supermassive black hole's greedy, guzzling eating habits. Basically, objects that pass beyond the event horizon fall toward the center of the black hole, and as they do so, they produce a magnetized jet of high-energy particles powerful enough to blast away from the black hole close to the speed of light. (How this fits in with the notion that nothing can escape a black hole, not even light, is a bit puzzling to me, but we'll go with it for now. Feel free to offer clarifications!) That jet plows into the surrounding gas, creating a magnetized bubble of high-energy particles, and as often happens with a collision, this in turn creates a shock wave -- intense sound waves rush ahead of the expanding bubble. 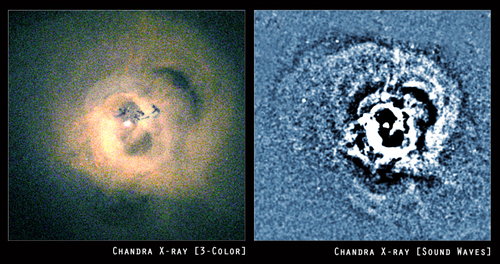 The rippling remnants of that shock wave are what Chandra detected. Finally, how can we not mention Mark Whittle? Whittle is a humble astronomy professor at the University of Virginia who made headlines around the world in 2005 when he unveiled his simulated soundtrack to the birth of our universe 13.7 billion years ago. The Big Bang is a bit of a misnomer: technically, it was neither big, nor a bang, and Whittle's analysis reflects that. He describes the associated birthing cries as "a descending scream, building into a deep rasping roar and ending in a deafening hiss" -- which sounds an awful lot like the sounds made by mothers giving birth, to the terror of anyone in the delivery room with them at the time. As with mothers, so with our cosmos. In the first 380,000 years of the universe, it was filled with a "rapidly expanding, hot glowing fog" -- essentially a primordial cosmic atmosphere. So yes, there could be sound in the early universe. The Cosmic Microwave Background Radiation, first detected in 1963 by Bell Labs scientists, is the "echo" of that first primal scream... a kind of "hiss" that permeates the universe uniformly. In 2003, the Wilkinson Microwave Anisotropy Probe (WMAP) generated its own headline when it provided the most detailed microwave map of space to date. It revealed minute variations in the background radiation, and the peaks and troughs of sound waves traveling through the early universe. The sound spectrum spans about 10 octaves, all well out of the range of human hearing, and thanks to computing technology, Whittle was able to translate that into an audible version and condense that first 380,000 years into five seconds. Have a listen here. It sounds rather like a jet engine slowly turning into static or white noise. "[the] marvelous dream [of the music of the spheres] is in fact closely realized in the physical world. The spheres, however, are not planets, but electrons and atomic nuclei, and the music they emit is not in sound but in light.... If our eyes were more perfect, we would see the atoms sing." Thanks to the glories of modern science, we can not only see unprecedented images of our universe that would otherwise be beyond our limited sensory ken -- we can also hear (literally!) the age-old "music of the spheres." A very nice article on the "woodstock of sustainable energy." Para 4 fix. "Based on Hafemeister's calculations, this means that no furnace heating is needed to maintain an indoor temp of 68 F until the outside temperature hits 65 F. If the internal heat is doubled (more people and more electronics) and the total insulation is increased by a factor of five in a super-insulated house, then the furnace won't go on until it is 35 F outside." I am a faithful reader. I LOVE your blog! First comment...yes, I know, I should comment more often. I promise I will! Anyway- I've heard an analogy of matter going into a black hole compared to water going into a juice cup. If the water faucet is on FULL blast, most of the water doesn't actually get into the cup but gets ejected out of it instead. Matter going into a black hole is similar...it can't all go in at once into the singularity so much of it gets ejected back out as x-rays. I'm sure someone else has a more scientific explination, but I've found the above analogy helpful for my Physics and Astronomy students! Jennifer, you may want to look into the work of Fiorella Terenzi, who turned radio emissions from a galaxy into sound on her album "Music From The Galaxies" released in 1991 (or thereabouts). Her website is http://www.fiorella.com (sadly outdated). A fabulous blog. I enjoyed it immensely. I have always thought of Black Holes as the Universe's recycling machines. The above analogy of a juicer inspired an evolution of my theory: What if Black Holes 'juice' matter? This might serve to recycle it and send it back out into the universe by separating it into energetic components, such as x-rays and/or magnetic waves. I thought I recognized that URL for the Northern Lights - from Steve McGreavy's Lost & Found Sound segment. The link you posted doesn't work for me - here's the G2 Surestream link. One of my favorite Lost & Found Sound pieces. That links doesnt work for me either, but the other ones in these comments did - thanks guys! And Jennifer - thanks for all the great posts, they keep me relaxed and entertained during my long work days!